Making it to Collective, this, the final day of the exhibition, the portacabins on Edinburgh’s Calton Hill are closed. 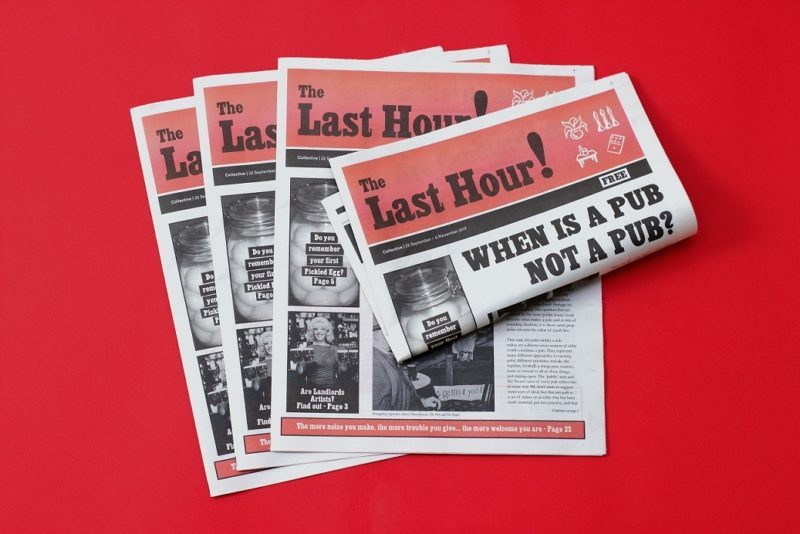 Sheets of ‘The Last Hour!’ mask the windows, this newspaper available from a red (now weatherproofed) box and all pubs within a one mile radius. Reminiscent of a shop shut for repurposing, the newsprint on the windows—off-white with a black print, red accent and colour images—forms content, context and backdrop for mirror written words projecting out from in. 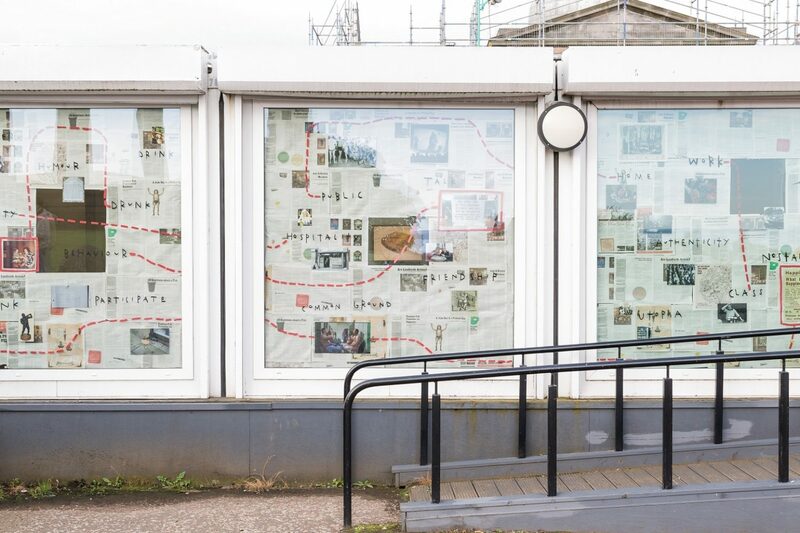 Partial narratives trace across the glass, themes drawn from the paper’s stories laced with pictures: ‘gender – nostalgia’, ‘work – class’, ‘behaviour – talk’. Strategic gaps permit a partial view inside, floating lit up ethereal images of a fresh pint, a clean ashtray, a shiny but ancient telly. Perhaps something close to the aesthetic of ‘The Ivy’ in London’s Nunhead/ Peckham Rye, the star of Sarah Turner’s film ‘Public House’ showing at Cameo Cinema today. Owners Enterprise Inns [xi] gave the community five days’ notice of closure, trying for a ‘vacant possession’ sale to a developer. The Campaign for Real Ale (CAMRA) had already applied to English Heritage to list this as ‘An historic pub interior of regional importance’. 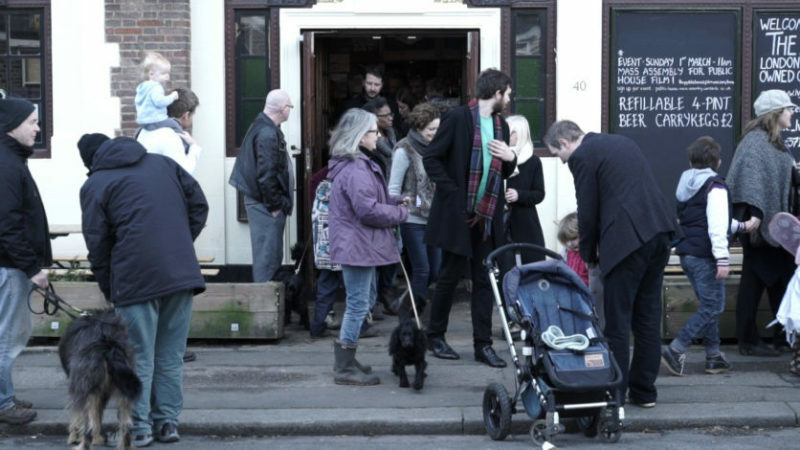 [x] The community got together, exercising their ‘right to bid’ for ‘assets of community value’, becoming the first to purchase a community building using the Localism Act 2011. An acclaimed victory of community over gentrification. In Edinburgh, ‘A Mass Observation Field Trip’ (offsite event née pub crawl), could help to explore these questions. The mapping permits investigation of the sites of the newspaper’s distribution. Participants do more than ‘ground truth’ the data: small groups visit pubs, recording occurrences, later sharing findings en masse. Does ‘getting’ or ‘capturing’ the atmosphere require (even partial) inebriation? Pub crawls, a form of alcotainment constrained by location and (potentially) specialist subject. The lawyer’s crawl: choose a landmark legal case, go to the site of that case and narrate it, have a drink in the nearest pub. Repeat. Narratives of lawlessness become increasingly loose. Despite no “drink problem”, wellbeing is present in ‘The Last Hour!’ through ‘Yoga for Bartenders’. [xiii] Bartenders may blossom but in yogic terms serving alcohol means they trade in ‘tamas’, a ‘negative and obstructive force that resists change, [embodying] darkness, not feeling, attachment, depression, lethargy, dullness, heaviness, stagnation and ignorance’. [xiv] This description echoes the guilt, shame and death like feelings that may accompany an alcoholiday [xv]—a necessary day of rest after excessive drinking. Happily, such symptoms can be alleviated by twisting postures (such as Marichyasana C) that stimulate blood flow to the abdomen. The alcoholiday, more than ‘a partial release of accumulating tensions’ [xvi], a grounding ‘break’, you (hopefully) wake up and the world is different. This is also ‘the last hour’ for Collective’s tenure in this temporary space just outside The City Observatory’s grounds. They make another, shorter, move to the Old Observatory House prior to permanently relocating to The City Dome. Walking around, it’s blustery, the portacabin’s short term dereliction infiltrates Calton Hill, surroundings tatty before the transformation. 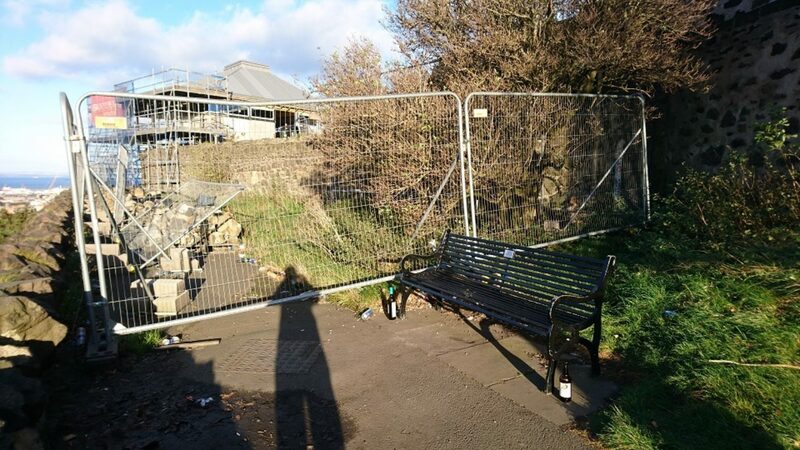 Stone buildings with gravitas, a visible seat of learning, garnished with bottles and cans: some stashed, some absentmindedly placed at the foot of a bench, evidence of pre-loading perhaps, intoxication enhanced by the crisp air and the scenic view. Satellites is Collective in Edinburgh’s development programme for emergent artists and producers based in Scotland. Anna McLauchlan is a teacher and learner who currently lectures in critical human geography at the University of Leeds. Thanks to Frances Stacey, Georgia Horgan and Timothea Armour for discussing the exhibition and to Barry Burns and Timothea Armour for commenting on an earlier version of this text. A massive thank you to Alice Bain, Laura Edbrook and Daisy Lafarge of Map for their exceptional editorial support in the production of all five texts associated with Satellites. [i] Mass-Observation, 1943, The Pub and the People: A Worktown Study. Victor Gollancz Ltd, London. Quotes take from pages 336 and 337. [ii] Detrimental health and other effects of alcohol are widely documented and then translated into guidance, for example NHS, 2017, The risks of drinking too much. [iii] Following a challenge by the Scotch Whisky Association this legislation was recently upheld by the UK Supreme Court. Scottish Government, 2017, Minimum Unit Pricing. [iv] Mass-Observation, ‘The Pub and the People’. [v] Anonymous, 2017, When is a pub not a pub? In Collective, 2017, The Last Hour! [Newspaper] 22 September – 5 November. pp.1-2. [vi] What does ‘substantially’ mean? Smoking, Health and Social Care (Scotland) Act 2005. [vii] Collective, ‘The Last Hour!’, at pp.10-11. [viii] UNESCO [United Nations Educational, Scientific and Cultural Organization], 2012, Old and New Tows of Edinburgh. [x] CAMRA, 2017, Pub Heritage Historic Pub Interiors. LONDON, GREATER - Nunhead, London SE15, Ivy House. [xi] Collective, ‘The Last Hour!’ at p.17. [xii] This echoes questions raised by Sally A Marston, 1990, Who are ‘the people’? : gender, citizenship, and the making of the American nation, Environment and Planning D, 8, pp.449-458. In the Scottish context, minimum pricing for alcohol will increase the price of cheaper drinks such as Carling bought in bulk but will not impact on more expensive craft beers. [xiii] Collective, ‘The Last Hour!’ at p.9. [xiv] This interpretation, reflecting orthodox approaches, is taken from Mark Kan, 2013, The Complete Yoga Tutor: A structured course to achieve professional expertise. London, Gaia, p.75. In observances known as niyamas drinking alcohol goes against saucha (or shaucha) cleansing the body and being pure in word and deed. However many yoga practitioners drink alcohol, some have incorporated into their teaching (for example by David Sye), and it has an ambiguous role in tantric rituals. A day on which ordinary occupations (of an individual or group) are suspended as a result of a hangover due to severe intoxication from alcohol the previous day or night before; a day of cessation from work as a consequence of previous alcohol intoxication. Incapacity to participate in formal work may turn this into a day of recreation or amusement. Often accompanied by feelings of shame or dread. Adapted from entries for ‘alcohol’ and ‘holiday’ from Oxford English Dictionary, 2017, Oxford University Press. Also the name of a Teenage Fanclub song from 1991. [xvi] Mass-Observation, ‘The Pub and the People’ at p.337.